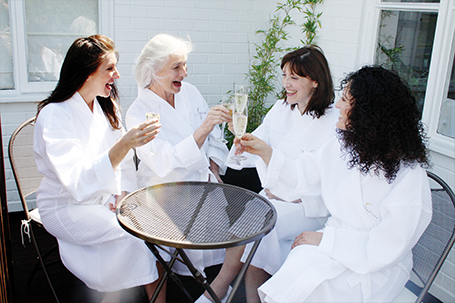 The Signature Spa draws a wide age group of clients from Bishop’s Stortford, Sawbridgeworth, Harlow, Stansted, Hertford, Epping, Saffron Walden, Dunmow, Chelmsford, Outer London and far beyond. We love to hear about our clients’ personal experiences at The Signature Spa and at The Anti Ageing Clinic by The Signature. I have been looking for a good Spa since I moved to Sawbridgeworth four years ago. I finally went to Signature Spa today after receiving a recommendation and have to say I was very impressed with the proffesional facilities, the staff and the prices. I will definitely be going back again. A little local oasis. I had fantastic treatments last Friday; back massage and reflexology with Siobhan, great value for money and literally sent me to sleep! Great experience! Thank you! The Signature Spa is a local destination that I associate with peace and relaxation. I'm a customer of the spa massage treatments and the experience is consistently highly satisfactory. The spa is professionally run, the staff are always very pleasant, helpful, knowledgable and make you feel at ease. The environment is clean, tidy and well put together helping relax you during the experience from start to finish. Very happy with the service. This is one of the nicest places to go to feel good about yourself. The staff are always there with a genuine smile and knowledgeable advice for whatever treatment that has been booked. There are not many places one can go to where you are made to feel 'Special' - this is definitely one to be visited. Very friendly professional staff with a lovely relaxed environment. Also love that I can park right outside! I am coming this Saturday for a pamper morning for my sisters Birthday which we are very much looking forward to! See you then! Fantastic treatments in a lovely, peaceful location, every time I'm lucky enough to go. Had the most amazing lava shell massage. Left feeling absolutely relaxed. Would definitely recommend the Signature Spa - 10/10. Really enjoyed a rare bit of 'me' pampering today, Marion is lovely and made it really special - thank you. Spent the afternoon here as a birthday treat and loved it! The whole place was very relaxing and I will be booking in again soon for another massage. I just wanted to say a huge thank you for an absolutely wonderful day on Saturday - the four of us had an amazing time being looked after like princesses in the relaxation lounge and all of our treatments were fabulous... we cant wait to come back! I just want to say a huge thank you to all of the ladies at Signature Spa for making us feel so special and for looking after us all day. All in all we had such a lovely day, I have been on spa days before and have spent almost twice as much and come away feeling nowhere near as good about the day. I would definitely recommend it and will be booking again it was such good value too. I’d just like to pass on my thanks to all the team for a lovely afternoon yesterday. The therapists facial technique was amazing. It’s such a change to have a therapist who did not rush through and undertook proper face massage. Thanks to you and everyone for looking after me so well - I felt truly relaxed. I shall be back soon. Really gorgeous surroundings, lovely and welcoming. Great attention to detail, professional service with staff doing everything possible to ensure you have the best time. I really did not want to leave, but will be back.